Baselworld 2018 ended over a month ago, but with the countless watches showcased over the week, remembering specifics may be difficult at best. We have compiled a list of the watches Rolex unveiled this year in Switzerland. Take a look and let us know what you think! Aptly nicknamed the Rainbow Daytona thanks to its use of multi-colored sapphires, the newest version of this bejeweled Rolex chronograph is the Everose gold Daytona 116595 RBOW. The pink gold Rainbow Daytona now joins its yellow gold and white gold sparkly siblings and no doubt, will be just as coveted. As with all modern Daytona watches, the new Daytona ref. 116595 RBOW sports a 40mm Oyster case outfitted with two screw-down chronograph pushers flanking the screw-down Triplock winding crown. The case is fashioned from Rolex’s patented rose gold alloy, Everose, named so for its promise to never fade. The lugs and crown guards on the case are set with 56 brilliant-cut diamonds for even more sparkle. Instead of the customary tachymeter scale, the bezel of the new Daytona ref. 116595 RBOW is embellished with 36 baguette-cut sapphires in a rainbow gradation, perfectly coordinating with the 11 baguette-cut colored sapphires on the black lacquer dial. What’s more, the three pink gold crystal registers shimmer beautifully in contrast to the dark dial. The matching Everose gold center hour and minute hands include Chromalight luminescence, which glows vibrant blue in the dark. The new Rainbow Daytona 116595 is presented at Baselworld 2018 with a solid Everose gold Oyster bracelet with polished center links. There’s also the robust Oysterlock folding clasp outfitted with the Easylink 5mm extension system for those days when your wrist needs a little more wiggle room. To power the watch, the Daytona ref. 116595 RBOW houses the famous Caliber 4130 in-house automatic chronograph movement that Rolex first released 18 years ago. With 72 hours of power reserve and a frequency of 28,800 beats per hour, the Caliber 4130 furnishes the Daytona with the hour and minute hands, the center chronograph hand accurate to within 1/8 of a second, the running seconds subdial, the 30-minute counter subdial, and the 12-hour counter subdial functions. Identical to all Rolex watches produced from 2015 onwards, the Superlative Chronometer Officially Certified Daytona ref. 116595 RBOW guarantees an accuracy rate of -2/+2 seconds per day. With the new Daytona ref. 116595 RBOW chronograph, Rolex has produced yet another must-have status watch for the celebrity set and uber rich. 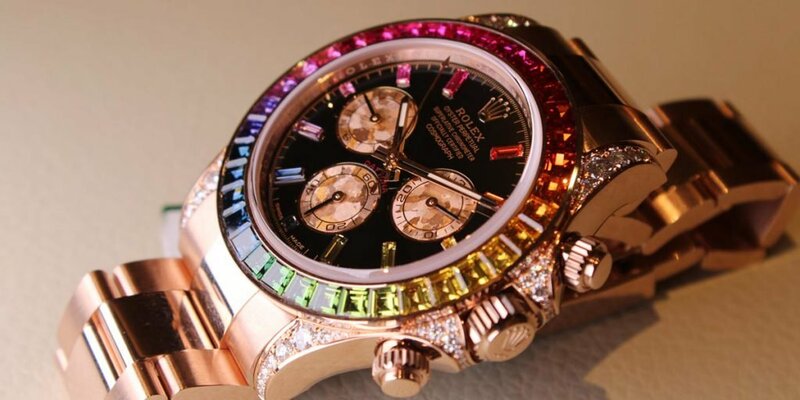 While the lavish gems on the pink gold Daytona may not be to everyone’s taste at Baselworld 2018, there’s no denying the incredible skill it took for Rolex’s master jewelers to create the precious rainbow path crowning the watch. With a new movement and slight design tweaks, Rolex updated their hefty extreme dive watch collection with the new Deepsea 126660. Similar to the original Deepsea models, the stainless steel (aka Oystersteel) Oyster case of the Deepsea ref. 126660 is built to be water resistant to an incredible 3,900 meters (12,800 feet) thanks to the patented Ringlock System. This architectural approach combines a nitrogen-alloyed steel ring at the center of the case, a domed sapphire crystal measuring 5.5mm thick, and a steel and titanium caseback. Although the new Rolex Deepsea 126660 retains the 44mm case size, the lugs have been reshaped slightly to feature a rounder taper and are a touch slimmer than the ones on the preceding Deepsea 116660. While this is a blink-and-you-may-miss-it adjustment, the steel Oyster bracelet is in fact notably broader and now better proportioned to the beefy case. Due to the wider bracelet, the Oysterlock clasp has also been revamped to fit accordingly. The Oysterlock still includes both the Fliplock extension system to extend the bracelet by 26mm to fit over a wetsuit along with the Glidelock system to increase the bracelet by 20mm in 2mm increments. Again, in keeping with the design cues of the previous Deepsea models, the new Deepsea ref. 126660 comes with a choice of two dials—the standard black dial option and the D-Blue blue to black gradient dial. 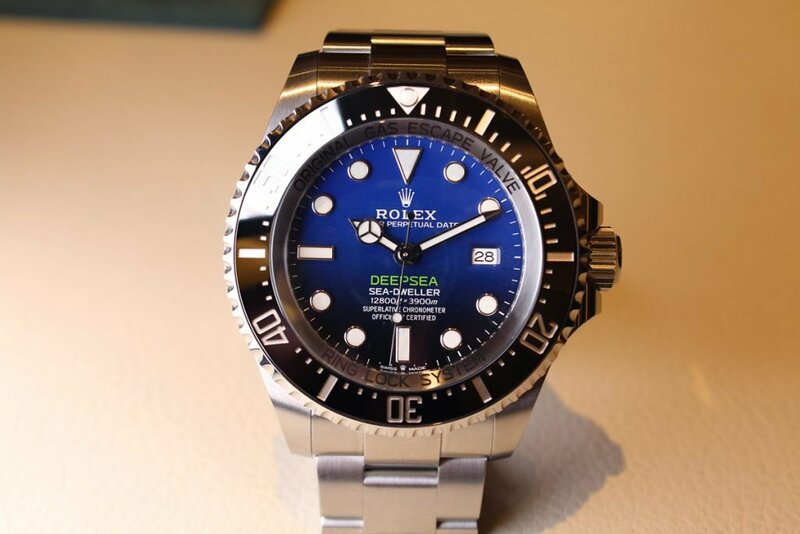 The D-Blue Deepsea was first created in 2014 as a tribute to James Cameron’s record-breaking solo dive to the ocean’s deepest point in the Mariana Trench. Both the black dial and the James Cameron D-Blue dial of the Deepsea ref. 126660 feature the familiar large luminescent hour markers, the Mercedes-style hands, and the date indicator at 3 o’clock. Particularly noteworthy is the lack of a Cyclops magnification lens on the domed sapphire crystal on all Deepsea models. As a pro dive watch, the Deepsea comes equipped with a unidirectional bezel in scratch-resistant and fade-proof black Cerachrom ceramic. In addition to the design refresh, the Deepsea ref. 126660 runs on the new generation Rolex Caliber 3235, which was introduced in 2015. As of Baselworld 2018, the new 3235 automatic movement includes a 70-hour power reserve, the Rolex patented Chronergy escapement, and an accuracy rating of -2/+2 seconds per day. In true Rolex fashion, the brand took their already technically and aesthetically impressive dive watch and made it even better with a few key improvements. Rolex updates their signature dress watch line with new generation Datejust 36 references with slightly restyled cases and a new movement at Baselworld 2018. The first new Datejust 36 models to join the collection are two-tone models—the two-tone Oystersteel and Everose gold Datejust 36 and the two-tone Oystersteel and yellow gold Datejust 36. It’s interesting to note that there are no full gold or full steel models just yet, but Rolex will undoubtedly make these available in the near future. As the collection name clearly implies, the new Datejust 36 watches maintain the popular 36mm Oyster case size. However, as we’ve seen with other 2018 Rolex releases, the lugs and sides have been slightly redesigned to offer better proportions. Staying true to modern Datejust design codes, the new two-tone 2018 Datejust 36 models are available with fluted, domed, or diamond-set bezels. Furthermore, similar to all Datejust watches, the newest Rolesor Datejust 36 watches come with a wide variety of dial options and the choice between the sportier three-link Oyster bracelet or the dressier five-link Jubilee bracelet. Naturally, the date window after which the model is named sits at the customary 3 o’clock position, while the Cyclops magnification lens is attached to the exterior of the sapphire crystal. 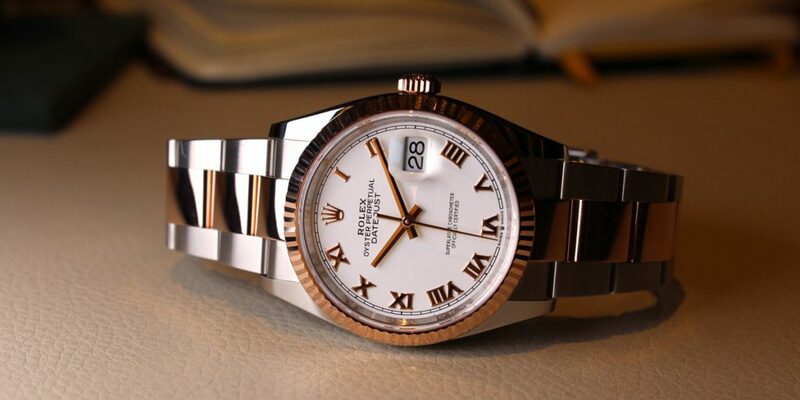 Aside from the design enhancements, the biggest change to the Datejust 36 range is the addition of Rolex Caliber 3235. This in-house automatic mechanical movement—first debuted in 2015—drives the time and date functionality of the Datejust watch and provides an increased power reserve of 70 hours thanks in part to the improved barrel construction and the highly efficient Chronergy escapement. Identical to all Rolex watches manufactured from 2015 onwards, the new Datejust 36 watches promise an accuracy rating of -2/+2 seconds per day. There is no denying the universal appeal of the classic Datejust 36 luxury watch and with these new technical and style improvements, Rolex ensures that their flagship model continues to be relevant for decades to come. Echoing the improvements made to the new Datejust 36 models at Baselworld 2018, Rolex also introduced a new generation of the ladies’ Datejust 31 watches with new cases and a new movement. While the ladies’ new Datejust 31 models may not get as much press as the brand’s sports models or even the men’s Datejust watches, you can be sure that Rolex pays plenty of attention to their best selling model! Yet again, the 31mm Oyster cases underwent a redesign of the case sides and lugs to improve the overall proportions. However, the latest Datejust 31 references are exclusively available in 18k yellow, white, or Everose gold for the time being. But it’s safe to say that it’s just a matter of time until Rolex will offer new steel and two-tone versions as well. There are a few bezel styles available on the latest gold Datejust 31 references. Dial options are abundant from simple classic shades to lavish diamond pavé dials dotted with mother-of-pearl butterflies. Of course, regardless of the dial style, the signature date window at 3 o’clock remains constant. And like most Rolex watches with a date feature, there’s also the distinct Cyclops lens protruding on the outside of the sapphire crystal. All three shades of the solid gold Datejust 31 watches are made available with the prestigious President bracelet with the signature semi-circular links. Furthermore, the yellow gold and Everose gold versions also come with the option of an Oyster bracelet. For the first time, at the heart of the recently launched Datejust 31 ladies’ watches is Caliber 2236—the newest automatic movement for Rolex’s women’s watches, which was introduced in 2014. Equipped with a patented silicon Syloxi hairspring, Caliber 2236 offers enhanced resistance to magnetic fields, temperature swings, and daily knocks. Caliber 2236 operates at 28,800 bph and provides 55 hours of power reserve. The women’s Datejust watches are famously known as the Rolex’s highest selling models and with these new advancements in design and mechanics, the brand is looking to continue that path. For 2018, Rolex unveiled the brand new GMT-Master II ref. 126710 BLRO. Crafted in Oystersteel, and sporting the popular blue and red bezel in ceramic, the GMT-Master II “Pepsi” is the hottest luxury watch of the year. Although Rolex retained most of the design details that make the GMT-Master II pilot watch distinct, there are a few changes to note. The redesigned 40mm Oyster case comes with thinner lugs built to accommodate the Jubilee bracelet. In fact, the new steel GMT-Master II ref. 126710 BLRO is exclusively available with the dressier five-link Jubilee bracelet rather than the sportier three-link Oyster bracelet. 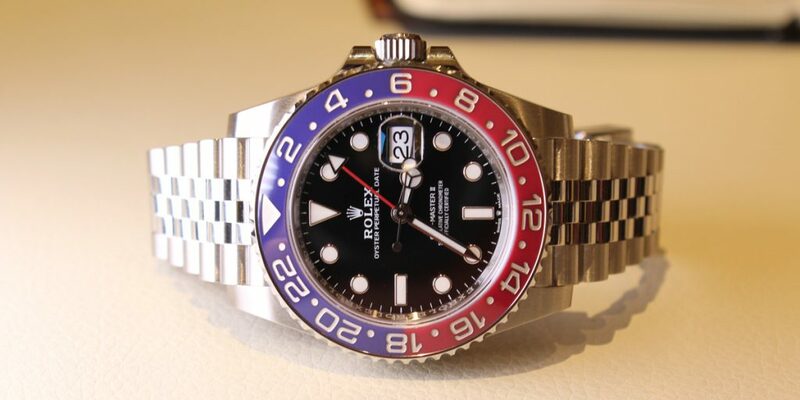 This curious decision is probably to differentiate the steel version from the white gold GMT-Master II 116719 BLRO with the same ceramic Pepsi bezel. The biggest talking point of the 2018 GMT-Master II 126710 BLRO is the blue and red ceramic bezel. These two colors first appeared on the inaugural 1955 GMT-Master watch in Bakelite form and since then, the so-called Pepsi bezel has become as iconic as the watch itself, appearing on different GMT-Master and GMT-Master II references throughout the years. Yet, the last time Rolex used the Pepsi bezel on a steel GMT-Master watch was on the GMT-Master II ref. 16710 with an aluminum bezel, which was discontinued in 2007. The GMT-Master II ref. 126710 BLRO is the first time Rolex marries a steel GMT-Master II watch with a ceramic Pepsi bezel. As with all GMT-Master II watches, the new GMT-Master II ref. 126710 BLRO displays two time zones simultaneously, along with the ability to indicate a third time zone with a few clicks of the rotating bezel. This is done via the extra red arrow-tipped GMT-hand on the dial, which points to the 24 numerals on the bezel. The black dial of the 126710 BLRO also sports the familiar lume plots, Mercedes-style hands, and date window at 3 o’clock accompanied by the Cyclops magnification lens on the sapphire crystal above it. However, encased within the new steel GMT-Master II Pepsi is a brand new automatic movement. Boasting 10 patents, the new Rolex Caliber 3285 movement offers an increased 70-hour power reserve and an accuracy rating of -2/+2 seconds per day. Suffice to say that the new 2018 Rolex GMT-Master II 126710 BLRO hits all the right notes by combining cherished details like old-school red and blue with modern materials and mechanics. To accompany the newest generation of the steel GMT-Master II Pepsi, Rolex also launched the Oystersteel and Everose gold GMT-Master II ref. 126711 CHNR. Reminiscent of vintage “Root Beer” GMT-Master watches, this is a modern interpretation of the two-tone Rolex pilot watch. While Rolex has offered yellow gold and white gold GMT-Master watches before, Baselworld 2018 is the first time they’ve used Everose gold in the collection. As a two-tone model, the GMT-Master II ref. 126711 CHNR combines steel with 18k pink gold throughout the watch. The steel 40mm Oyster case sports an Everose gold bezel with a Cerachrom ceramic insert, in addition to an Everose gold winding crown. Furthermore, the Oyster bracelet includes Everose gold center links flanked by steel outer links. The bi-colored rotating bezel of the two-tone GMT-Master II ref. 126711 CHNR combines black and brown ceramic along with pink gold numerals. In fact, this is the first time Rolex offers a black and brown ceramic bezel. Ceramic is not only cherished for its striking look, but also for its resistance to scratching and fading. Of course, like all GMT-Master II watches, the 24-hour marked bezel is used in conjunction with the extra GMT-hand on the dial to indicate a second time zone. Furthermore, turning the bezel can also tell a third time zone. While some may lament the use of a black dial on the 126711 CHNR rather than a brown one, we like how it matches the black portion of the bezel. Plus, the gold surrounds on the round luminescent indexes and the gold Mercedes-style hands matching the pink gold on the case and bracelet tightens up the overall style of the new GMT-Master II 126711 CHNR. Additionally, the dial houses the standard date aperture at 3 o’clock accompanied by the ever-faithful Cyclops magnification lens on the sapphire crystal. Yet another novelty on the GMT-Master ref. 126711 CHNR is the new generation Rolex Caliber 3285 automatic COSC-certified mechanical movement with 10 patents, a boosted 70-power reserve, and an accuracy rating of -2/+2 seconds per day. It’s rare that Rolex comes out with a design that we’ve never seen before, but the GMT-Master II ref. 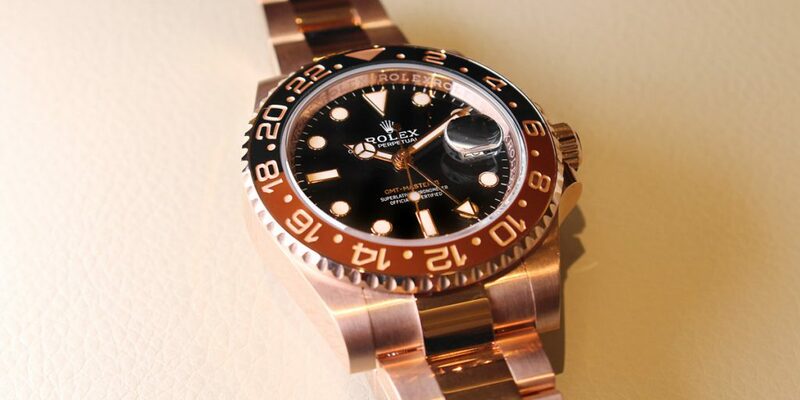 126711 CHNR achieves that by marrying pink gold and steel with black and brown ceramic. However, despite all the new features, the 2018 two-tone GMT-Master II still flaunts an undeniable familiarity that we can’t help but love.